There has been a lot of behind the scenes work in Orion 0.5 M1 to help prepare for a Fall 2012 1.0 release. In particular there was significant work on globalization, accessibility, and cleanup of code and API. We also found some time for a few new end-user features, listed below. 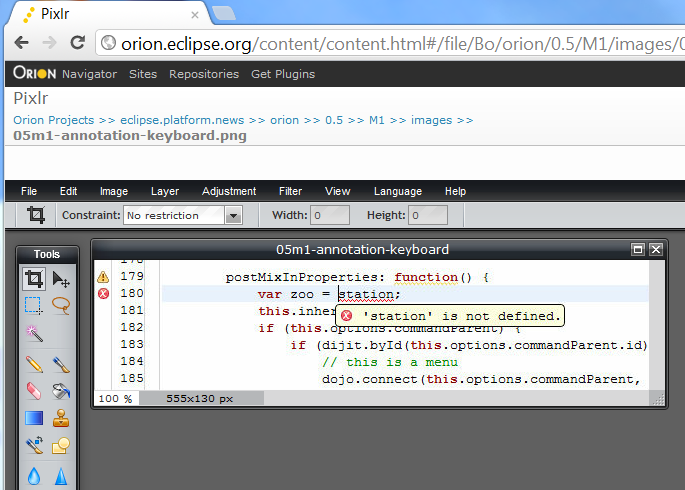 As usual, head to OrionHub to check it out, or head to eclipse.org/orion to sign up. You can also download your own copy of the server. To install this plugin, simply click Get Plugins in the top banner and select Esprima content assist. The Orion compare editor can now display differences down to the character level, in addition to coarse-grained blocks. Separate commands are available in the toolbar to navigate to the next or previous block or individual change. When you perform a search in the Orion editor, all matches are now highlighted. Matches appear both within the text, and in the overview ruler next to the scrollbar. This allows you to see the position of all matches in the file at a glance. You can now traverse through all annotations such as errors, warnings, and search results using the keyboard. As you traverse to a new annotation, the corresponding tooltip for that annoation will automatically open right below your cursor. This lets you quickly jump to the next error, find out the cause, and fix it without your fingers ever leaving the keyboard. You can now drag a zip file to import into Orion rather than searching for it in a file dialog. 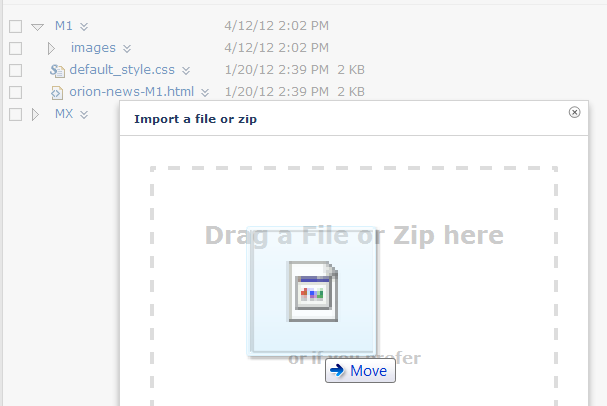 Select Import as Zip as usual in the Navigator page, and then drag a zip file onto the target that appears. Support for importing non-zip files is coming soon! You can now create, launch, and modify web sites directly from the Navigator page. Let’s say you have an HTML file in Orion and you want to launch it as a static web site. 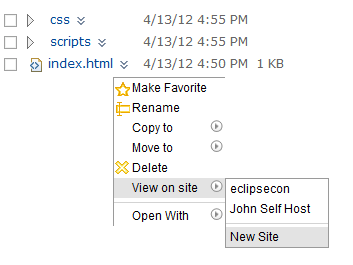 Simply open the actions menu next to the file and select View On > New Site. page and click Open With > Pixlr Image Editor from the actions menu next to an image file. This will take you to an Orion page with the Pixlr image editor embedded within it. When you save the file within Pixlr, you will have the option to save the result back into Orion. An experimental plugin is available that lets you store your Orion files on Amazon S3. For complete details, see the Connecting Amazon S3 to Orion blog post. A new service has been introduced, orion.page.content, that allows an Orion plugin to contribute page content. The plugin content is framed by the common Orion banner and equipped with standard Orion page services, such as the related pages menu. The page content itself is rendered in an iframe inside the page. This service was used by the above Pixlr plugin to make the third party Pixlr editor appear like an Orion branded page. Plugins can now use content types to validate file metadata when supplying commands in the navigator or editor. 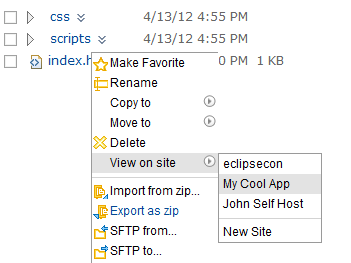 Before, plugins used file name extension patterns to specify what kinds of files they could operate on. Now, a list of content types can be used, which allows the plugin to be validated for multiple file types, as well as simplifying the specification. As we move closer to a 1.0 release, we have been taking a hard look at our APIs and cleaning them to be consistent and evolvable in the long term. Refer to the 0.5 API changes wiki page for complete details on what is changing. If you have already implemented plugins for Orion you should keep an eye on this page.